We had 10 EV models on display/available for test drives, along with owners sharing experiences and local experts on hand to answer questions. Ben and Jerry's brought their "Save Our Swirled" Tesla and scooped ice cream out of the trunk! 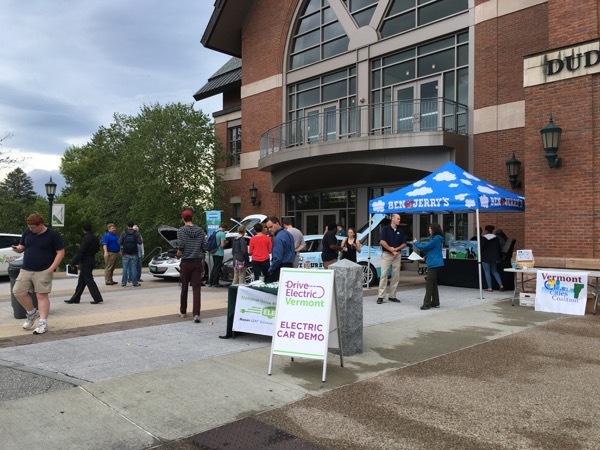 The UVM Transportation and Parking Services along with the Vermont Clean Cities Coalition will be hosting a Ride-and-Drive event outside of the Davis Center. Come check out several different models of EVs, talk with owners of EVs about their experience, and take a test drive or ride. Ben & Jerry's will be on-site scooping the good stuff and showing off their "Save Our Swirled" Tesla. As a bonus (not that you needed another reason, because... ice cream), enjoy free parking at any of the 9 campus EV charging station ports (charging rates will still apply). Registered attendees report 143,465 electric miles driven.